The immortal Alexei Maximovich Peshkov, who called himself Gorky, the Bitter One, was born 150 years ago at the Russian town of Nyzhny Novgorod. With novels and stage plays such as Foma Gordeyev, The Mother, The Lower Depths and Klim Samgin as well as close to 1,300 stories and essays a giant of world literature. Bitter with regard to the conditions in which human beings are living, but also incessantly optimistic in his confidence that people will not resign to these conditions. Immortal, but whereas theatres around the world still stage his plays, his other works seem to have disappeared from publishers’ catalogues. A close friend of Lenin’s, simultaneously a critic and supporter of the Soviet Union’s leadership, initiator of numerous cultural projects and tirelessly fostering other writers, he became the target of a huge smear campaign during the period of “restructuring” Soviet society known as perestroika. A smear campaign that far exceeded allegations such as the ones thrown at that other bête noir Jean Genet, and lasting many years after the end of the Soviet Union. 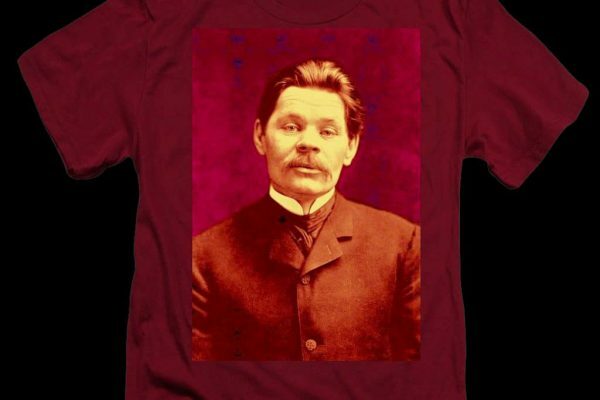 Both in Russia and in the West he was suddenly considered a Stalinist idol that had to be torn from its pedestal. His name was removed from places and streets named after him. Fortunately, people in Moscow still read a lot and recently there has been something like a Gorky revival there. Even Gorky’s portrait, which had been removed from the title page of the influential literary magazine Literaturnaja Gazeta, is shining there again next to Pushkin’s. 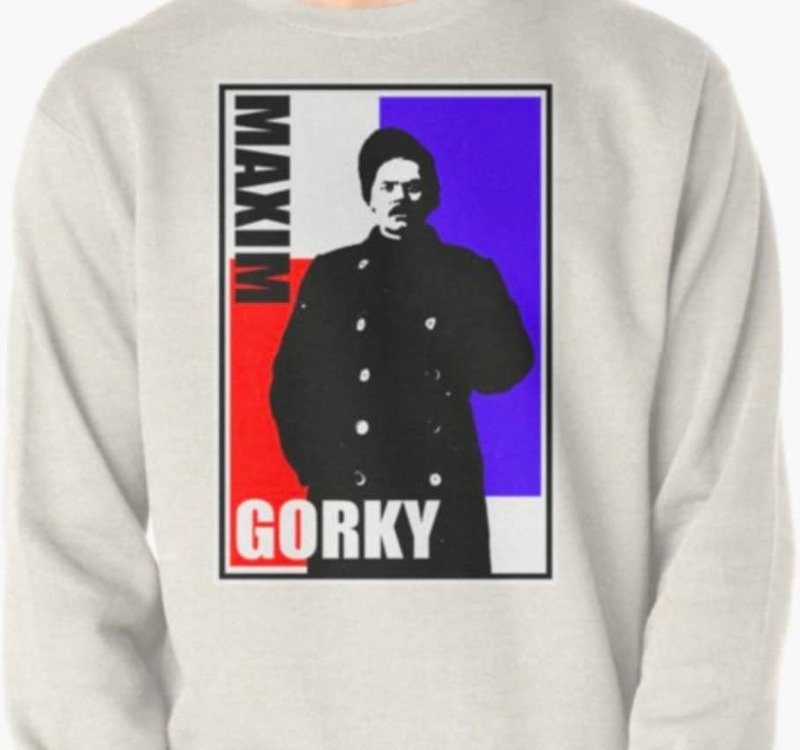 Gorky was born on March 16, 1868. At the age of four, his father died. Six years later he lost his mother. He spent most of his childhood with his grandparents, who were running a small business of textile dyeworks. His grandfather is supposed to have been a violent tempered man, but his grandmother was a smart educator, and taught the boy countless Russian songs, sagas and fairy tales. The family being extremely impoverished, he had to earn a living by himself at the age of eleven. He collected scrap from the city’s courtyards, worked as a grocery apprentice, technical designer, dockworker, and as a dishwasher on a Volga steamboat, until he made his way to Kazan, where in 1884 he joined the revolutionary students there, striving at continuously educating himself further. Here he started to read Karl Marx’s Capital in Plekhanov’s translation and to spread revolutionary propaganda among the peasants of the Volga region. For years on end, he walked along the Volga, lived with fishermen, workers, homeless and exiled people, and lived from odd jobs as a messenger boy, servant, baker’s assistant, nightwatchman, railway guard or whatever came his way. After the repression of a student demonstration in Saint Petersburg in 1901, Gorky composed the Song of the Stormy Petrel, which became the battle song of the Russian labor movement in the years leading up to the October Revolution. Gorky was arrested and incarcerated in the Peter-and-Paul Fortress early 1905, but soon released after a wave of national and international protests. His apartment in Saint Petersburg became a meeting place for the illegal Russian Socialdemocratic Laborparty, where bombs were built and arms collected for the Moscow uprising in 1905. This is how he got acquainted with Lenin. Subsequently, Gorky helped establish a printing operation and the first legal periodical of the Bolsheviki, Novaya Zhizn (New Life), directed by Lenin. Soon other stage plays were to follow, such as Enemies and The Last Ones, premiered in Berlin, and longer essays for Novaya Zhizn, such as Remarks on Middle-Class Life, The Destruction of Personality, On Cynicism, On the Problem of Antisemitism, On Blockheads, and Two Souls. Essays in which he denounces “the groveling of the bourgeois mind”, criticises Dostoyevsky’s and Tolstoy’s fatalism, and expresses his “hatred against the old world”. Before his return to Russia in 1913, he finished the first part of an autobiographic trilogy, which ten years later contained the volumes My Childhood, In The World and My Universities, and in which he gets even with “dead life” and its “heavy burden of dreadfulness”. Apart from two voluminous novels, The Artamanov Business and Klim Samgin, Gorky after the October Revolution of 1917 focused on writing articles covering current political issues, and engaged in fighting widespread illiteracy, encouraging young writers “to take down the splendour from the petit bourgeois.” Gorky played a significant role in the educational and cultural revolution of the Soviet Union’s first ten years. He became a teacher at the first Workers and Farmers University, led a multitude of cultural study groups, founded the first Soviet children’s magazine and initiated several larger publishing projects for the dissemination of the classics of world literature and documents on the history of Russian literature and the civil war. Due to the conditions of war, hunger, cold and destruction of the economy, many of these projects advanced only slowly. Gorky was very ill when he followed Lenin’s advice and by late 1921 went abroad again. He returned to the Soviet Union in 1928, but stayed there for good only from 1933 until his death on June 18, 1936. His adversaries, among whom writers like Vladimir Nabokov, Ivan Bunin and Aleksandr Solzhenitsyn, reproached him his occasional adaptation to Stalin’s politics, but, apparently, not many alternatives were left: for Gorky, the greatest threat emanated from Nazi fascism, as he also expressed in the two stage plays from this period: Somov and Others and Yegor Bulychov and Others. He did refuse, however, to write Stalin’s biography. 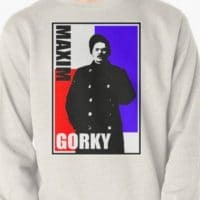 During the last fifteen years of his life, Gorky produced a large number of stories and articles that are mainly concerned with helping people change themselves and rid their minds of the old social order’s remnants. On the marshy moss gathering hill and the point of view, On ‘small’ people and their enormous work, On petit bourgeois mentality are typical features of this period. On the proletarian author is one of the essays in which Gorky turns to three major issues in literary theory, i.e., the essence of the artistic method in Soviet literature, the ambitious artistic form of contents focused on the new human being, and the author’s perspective of capturing realistic impressions of life while clearly taking sides. In On reality he expects writers to be “the ears and the voice of the working class”, enabling them to reflect “its moods, wishes, concerns, passions, interests, mistakes and preferences”. Early 1932, the Soviet leadership dismantled the country’s various artist organizations and established unified associations for each of the creative professions. Within months, Socialist Realism was instituted as a compulsory directive, and in the years to follow Gorky became one of its principal advocates. At the much-quoted Congress of Soviet Writers in 1934, Gorky laid out the criteria to which revolutionary literature had to conform, considering that “our words are our weapons”. Yet On language and other articles written during this period continued to be largely consistent with the convictions he had been articulating over the previous decades. Against “the compromise with the atrocities of reality”, he published the booklet How I learned to write, providing potential writers with tips, suggesting them “to press the words together like fingers for a fist”.